For most of this summer, I worked at a camp. It was, as usual, a great experience. Although it was a crazy hot summer in southern Alberta, the temperature made for a great summer filled with plenty of fun activities. But the heat also made the cabins became extremely hot. This was the worst at night, where it was almost impossible to sleep. We had to think of different ways to cool down the cabin. Some people thought it would be a good idea to get a big fan with a bucket of ice in front of it, but we did not end up doing this. One of the ideas actually worked really well. When it was late in the evening, we would set up two fans; one at each window of the cabin. One fan would be blowing air into the cabin, and the other would be blowing air out. This would move the air around the room and quite effectively cool the cabin down by the time we went to bed. Now, I probably should have thought of the idea, since it is basically the same as what a computer cooling system does. Some fans pull air in, and others push air out. There is more to it, but at its base this is all that happens. I think there is a lot more to consider when it comes to case fans than with fans for a room though. There is a wide variety of models and manufacturers to choose from when it comes to picking a case fan. Some are more focused on silence than performance, or you can go a balanced route, finding one that performs quietly. Other fans are more focused on static pressure, while some more on airflow. 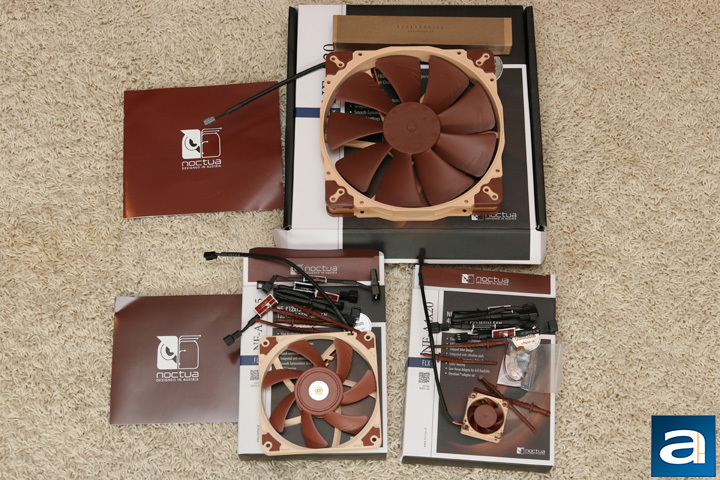 One manufacturer known for its quality, performance, and silence is Noctua. Today, we have the entire Noctua NF-A series up for review, including eight fans, some anti-vibration mounts, and a fan controller -- all of which I will be covering in this one review today. The Noctua NF-A series arrived in a medium sized brown corrugated cardboard box in mostly good condition. However, considering it was shipped all the way from Austria, I would say it arrived in great condition to our APH Networks location here in Calgary, Alberta, Canada. It was shipped via UPS Saver, and as you can see from the above picture, UPS did a great job in ensuring its safety. After opening up the shipping box, there was sufficient padding to keep everything tightly packed, guaranteeing the products stay in place throughout the entire trek. The steps taken to safely transport the Noctua NF-A series was sufficient. In the shipping box, we received eight fans: Four 40 mm fans with different speed controls, two 120 mm fans, and two 200 mm fans. Also included were Noctua's NA-SAV3 and NA-SAV4 anti-vibration mounts, NA-SAC5 SATA to 4-pin power adapter cable, and the NA-FC1 fan controller. It is safe to say this is the biggest review I have ever done, and will also be the most products packed into one review here at APH Networks. 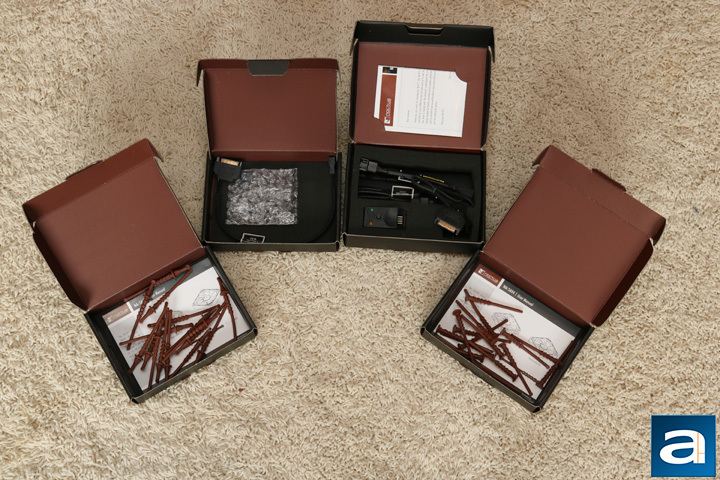 The retail boxes are in typical Noctua fashion. The 40 mm and 120 mm fans have the exact same retail box, with it being mostly dark brown on the right side, and then a white panel running down the left side. The way the speed is controlled in each fan is written in a small blue square on the white panel, ensuring there is no confusion to which fan is which. A front flap is kept in place with some Velcro, making it easy to lift it to see the fan and the specifications of it. There is also a handy little list informing us of all the contents inside. The two 200 mm fans' retail box is slightly different than the other fans in the series. 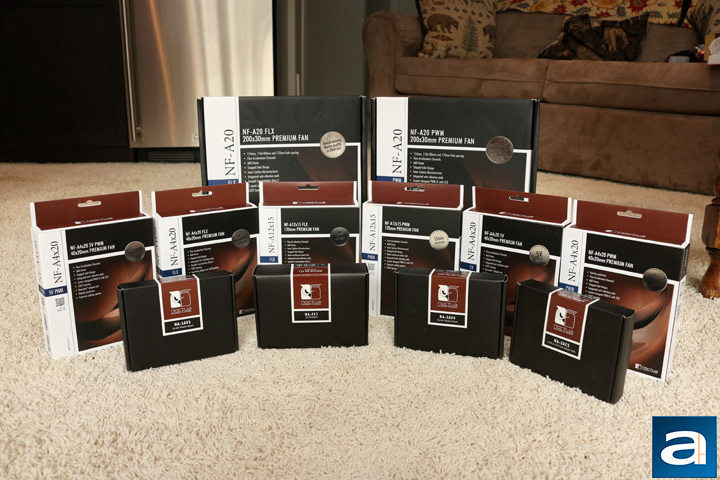 Their retail box does not feature the classic Noctua brown; instead it only has the dark brown and black colors. The anti-vibration mounts, fan controller, and SATA to 4-pin adapter have the same retail box design. 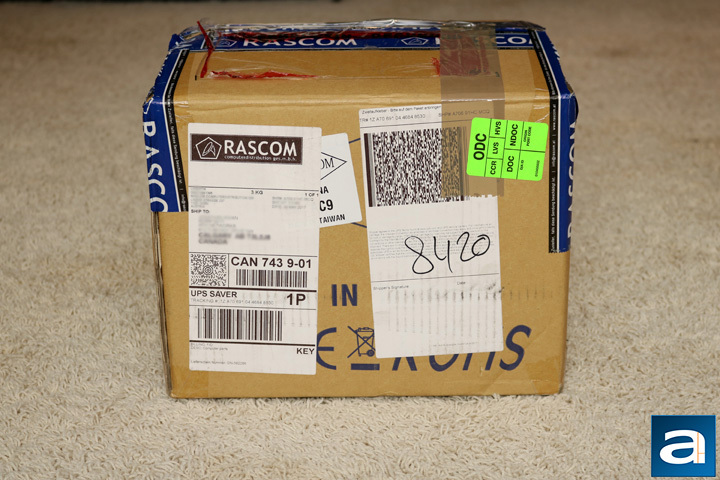 It is a small, mostly black box, with the Noctua logo and product name found in the center. Just like the retail boxes, the packaging for the 40 mm and 120 mm fans is different than the 200 mm fans. For the smaller fans, the top tab opens up, and a plastic mold can be slid out. The plastic mold holds the fan, anti-vibration mounts, and all the included cables. It is a very effective method to keep all the contents in place to ensure nothing can bounce around inside the retail box. For the 200 mm fan, things work differently. The entire front of the box opens upward, revealing a manual and the 200 mm fan kept in place by a cardboard cutout. After removing the fan and the cardboard cutout, there is a small cardboard box with all the accessories inside. All in all, the packaging is effective in presenting the products in a simple and clean manner. The other products included have an even simpler packaging design. Just like the 200 mm fans' retail box, the front opens upward. For the vibration mounts, there is a small page with all the instructions on it; everything else is kept loosely inside. The packaging to the SATA to 4-pin adapter is the same, while only the fan controller is different. The fan controller has a lot more padding to keep it all in place ensuring its safety. There are also a couple more cables included; however, not too much as it is a really simple fan controller. Setting up is as easy as connecting a fan to a motherboard header. posted 5 hours and 55 minutes ago, with 12 posts. posted 5 hours and 55 minutes ago, with 9 posts. posted 5 hours and 56 minutes ago, with 3 posts. posted 5 hours and 58 minutes ago, with 4 posts. posted 5 hours and 59 minutes ago, with 11 posts. posted 6 hours ago, with 56 posts. posted 6 hours ago, with 11 posts.